The Patriot Burst Solid-State Drive (SSD) is the perfect way to enhance computer performance. Burst offers transfer speeds at up ot 560MB/s read and 540MB/s write to eliminate bottlenecks. With a SATA III interface, this SSD provides greater performance over traditional HDDs.At only 7mm high in a 2.5" form factor, the Burst is perfect for any ultrabook or laptop upgrade. 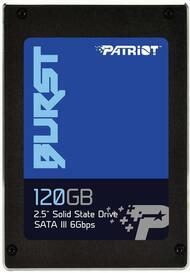 Patriot's Burst SSD comes in two sizes for every user, at 120GB or 240GB.